Yesterday I showed you part 1 of this gorgeous home I toured on Sunday. If you missed yesterdays post you can read it here. Design studio. Love the cart on wheels. Master Bedroom with sitting area below. Concrete bench in shower. How unique is that? I took the picture of the bottle tree especially for Susan at Between Naps On The Porch. Yard backs up to the James River. I would like to thank Les and Bill Stinson for opening up their home and allowing me to show their lovely home on my blog. You can see more of this home at http://www.wlstinson.com/. I will be linking to White Wednesday at Faded Charm Cottage and The Inspired Room. What an absolutely gorgeous home! Stopping in to welcome you to SITS! Love this beautiful home. Every single room is eye candy. Thanks so much for sharing it. Beautiful home…luv that shower! Thanks for the tour…I had a great time. Stunning! I love the cart on wheels as well…and the bottle tree…going to have to make one of those. I've looked for a form but haven't found one yet. Thanks for sharing! I love the concrete bench in the shower! I don't have a bench in my shower and it gives me a great idea! Thanks so much. How incredibly beautiful! There are so many amazing detials- such great photos to study. Thanks for sharing! Hi Sherry! It's incredible!!! What a fabulous house! I LOVE the design studio! Oooo, and how they put a bottle rack in the garden!! Don't know where my comment went. I'll try again. I was saying that this house is so lovely and the whimsical and unusal decor gives this formal home a sense of warmth and welcome. stop. please. I've run out of Kleenex for the slobber. Oh wow this is a very pretty home! I love the anitques sign! The pictures are a really nice quality! 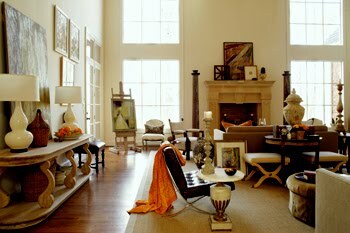 Now I'm in love with that long sofa table….. What a Beautiful Home…..
That. House. Is. Beautiful. Ooh just gorgeous. Love it.